[00:00] We're living in one of the world's most competitive job markets right now and honestly, we need to be doing everything we can to retain our top talent. Alright, industrial talk nation. That is Jacob user and he wants people to love what they do, but we know it's hard if they are ill prepared and we as companies, we just sit there and continue to just roll out the same old stuff thinking that we're going to change things. 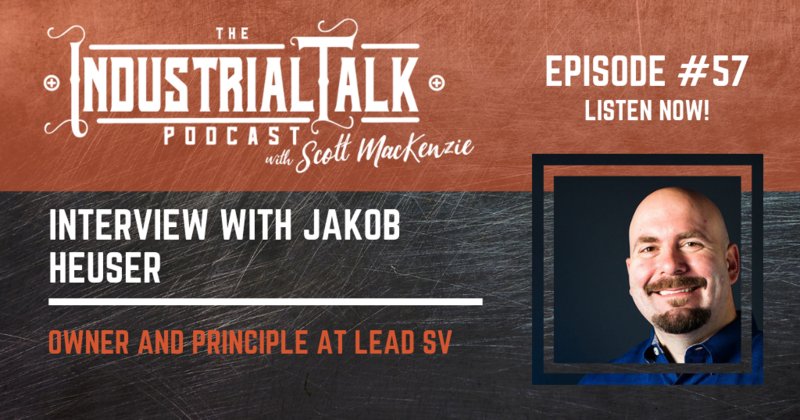 But this episode, this episode of industrial talk podcast, we dive deep with Jacob. [00:30] Welcome to the industrial talk podcast with Scott Mackenzie. Scott is a passionate industry professional, dedicated to transferring, cutting edge industry focused innovations and trends while highlighting the men and women who keep the world moving. So put on your hardhat, grab your work boots and let's go. [01:19] word two words for you listeners out there in Barcelona. Two words area, which I can't spell and topics which I can't spell either. I guess I could come close to it, but both are delicious. Industrial approved foods. So nonetheless, if you ever have a chance to go to Spain and Barcelona and uh, all around you gotta have that topis and a Paella because man, I'll tell ya, I ate, I ate it big time. And if you're out there on YouTube, you can see I got a new shirt. It's a Carhartt. It's got my little logo on it and everything. And as well as a hat. So need to be safe. Let's get this show on the road. Let's start talking tailgate talk number one. If you've been a listener of definitely the industrial talk podcast because well, I want you to be a. we've got the industrial success academy and it's getting ready to be launched. [02:09] I'm going to be shooting for the mid November and this is going to highlight some real big thinkers within the industrial space. It's all focused on the training. It's a training platform and it is specific to just, you know, you cannot get enough information out there. You cannot learn enough out there. Um, it's all, it's there. So these are the leaders in their field is once again in leadership and sales and marketing and operations and finance and technology and uh, go out there, check it out. And uh, we're pretty excited about that. Launch number two. Okay. YouTube Channel focusers are, there's a low watchers French truck coffee. Just got that. I think I put it in the camera anyway. I think I am, but nonetheless delicious. It's out of New Orleans, I believe. And uh, I just picked them up today at another place and I gotta tell Ya. That's delicious stuff. [03:10] So French truck coffee, we got Paya, we've got topis all delicious. Number three. Okay. One of the interviews that I've got slated for probably about a month ago or not a goal, but, uh, in the future, Alex viral brief. And if you're out there on YouTube, again, transform your company. I've got a book which is fantastic. Escape, frustration, align your business and get your life back. You know, what was interesting about the interview was the fact that, uh, you know, as well as I do, we just, gosh, we wrap ourselves around that interview and we just, or that company and, and, uh, we just, you know, forget about life in general. So he talks a lot about that. A great read. Once again, transform your company, escape, frustration, align your business and get your life back. Wonderful read. Should be able to hang out. Good stuff. All right, let's get with the interview. [04:07] Once again, Jacob, this is j a k o be Heuser. He is the interview for this particular podcast. And uh, I know as an industrial professional and, uh, having that experience within the industrial space, there we, we, we, we just do the same thing over and over again. Sometimes it, hoping to, um, change the way we look at business or transform our company, the culture, whatever it might be. Jacob recognize this and we dive deep into it. So enjoy the interview. This is Jacob Heuser and definitely check him out. All right. We've got Jacob user and I said that right, because we, before this whole thing happened, Jacob, I uh, I made sure that I got that right. Heuser. Is that right? Awesome. Yeah, that's right. Thanks for having me on the show today. My pleasure. And thank you very much for joining the industrial talk podcast. [05:58] of software engineers in the world that can turn around and sit there and say, oh yeah, and I have a background in building training. [06:05] I see that's pretty cool, but. But I'm telling you, this is where we're going on this particular conversation is because what fascinates me about you, Jacob, is the fact that you realize the necessity. If a company truly wants to be successful, if the company truly wants to expand that network and grow that company, you better have a training mindset as well. So let's get a get a little background and for 11 on you talk to us about a little bit about where you come from and why you're so spectacular. Jacob. [06:35] Yeah. So I started out like most software engineers doing a software engineering job that most people look back on and go, you worked for who? And for me, that was actually working for something called the Homeland Security Digital Library. Sounds delightful. Mr. hst out, we were actually trying to catalog everything that was happening in media and policy shortly after nine slash 11. So that was, it was me and like 15 librarians. Uh, it was a really interesting workplace. [07:17] inflammation. Like, like what type of information? So a lot of it was news and policy and things like that that evolved over time. It's pretty cool because they were trying to teach people about the concept of homeland security. But there was no reference point, there was no textbook on it. And the reason there were 15 librarians was because between individual first responder units, things mean different things have different meanings. So like code blue for an officer is different than code blue in a hospital. But if you're trying to figure out like what's happened to the number of code blue responses post nine slash 11 or after a policy was created, suddenly you had to contextualize that phrase [inaudible] are you talking about Code Blues and hospitals? You talking about code blues and police, like which one? And so there was 15 different librarians to help contextualize what that article was referring to so that it was searchable. [08:12] And that was Kinda the start when I began to realize I had gotten my master's in instructional design by that point and I started to realize, well holy crud, a lot of the stuff that we do, because I mean even homeland security, we had this training program and it was literally an instructor at the front of the room for 16 hours talking about color energies or something like that. And there was no contextualization. Here I am a software engineer trying to relate to the person that I was in my group that was in sales and I would explain the problems that we were having, whether it was leadership problems or technical challenges. There are communication challenges. And I'd be met with a blank stare because the context was missing and I kind of took that lesson with me as I went in to LinkedIn, eventually went into Pinterest to pretty large silicon valley companies realizing that anything we do to educate and the workplace has to be contextualized, it has to be made relevant or you're just going to get met with blank stares like the sales guy, as I was explaining it, a bunch of software problems. [09:22] I remember it vividly. I was doing some work for Price Waterhouse Coopers and I remember that day vividly. And then I'll remember the evolution of what took place to try to coordinate communications and standardizations and all of the stuff. I mean this was so unique. And then. And then being able to classify certain threat levels and that it was, it was just all over it. And somebody would say, you know, it's a threat level of plaid and I'm going, what does that mean to me? You know, that's a joke. That's all it is. It's just a joke. But it's, it's the, the, the, what that is all about it. That's, that's heavy lifting, my friend. That's heavy lifting. So let's go into the why we're here and what fascinates me about this is because I know that I'm going down the road of creating a training platform because I think that there is a tremendous need and reading around and all that good stuff. And yet you, you're in the thick of it, right? Talk to me about that pain. Why, why, why me as a business owner, industrial business owner wised why is training important? And one of the big things for me is, is bring the wow when I'm doing my training because there is a lot of dry stuff out there. Document. [10:36] Well there's a ton of dry stuff and I think one of the problems is like we're in this competitive job market. It's the most competitive market we've seen in the last 20, 25 years and I want you to take a moment and think about who your top employee is and what it would be like if you lost them. How are you going to retain them? And I know a lot of people, their first reaction is going to be, oh well I would pay them more, but what happens when money isn't enough? Suddenly Gallup put out a poll recently that found the millennial generation and later or the 87 percent of them aren't valuing salary is the most important thing in their job. Like you can suddenly get to a point as a business owner and be like, I'll pay you more. And they'll be like, oh, but it's not about the money anymore. No Way. That's training development comes into play because it's like, well, I can't pay you more, but I can give you opportunities to grow. I can give you leadership chances. I can give you the skills you need to grow your career here at the company in a way that other competitors for your job, your job time can't do. [11:45] But here's the deal. When, when did that transition occur? Because everybody was always focused on, I got to make more money. I got to make more money. I got to make more money outside the changes that have been taking place within the Labor. And I can't say labor in the market, the employment market space, right? Uh, it's not uncommon for people to zip around and do this and go over here and leave that company and go there. And because they're all searching for that additional information at that, that ability to be able to make themselves better. When did that happen? [12:16] So it's, it's been a groundswell. So when you think about it, Scott, we're pretty much on track. I'd say about two years from now, the millennial workforce is going to be more than 50 percent of our workforce generation. So it's not like these people haven't existed, it's just they haven't been the majority. And as they're becoming more and more of the majority, we're starting to see the shifts are to matter where as you mentioned, people are jumping from job to job. How much of a razor they get in between jobs, maybe five, k, maybe 10. A lot of people move in his lateral or they'll even take a pay cut and it's because they're searching for something. They're sort of searching for this meaning or this growth purpose. Yeah, they have purpose. They want their work to mean something and there's no reason you as a business owner can't actually dig in, understand what somebody wants, and then work to create those opportunities. In fact, I almost insist for your top talent, for the people you can't afford to lose. You should already be doing that. [13:19] How do you, you being the professional and in this particular space, how do you. How do you broach that subject within a company? First off the management team, the c level, whoever needs to think about the fact that maybe we should, we're losing people or we've got some churn and that important person left over to the competition and the through the exit interview or whatever it might be. They said, you know, they, they're feeding the homeless for whatever it might be. D, How do you approach that, that subject? How do you begin that effort? [13:57] So when I've worked with companies in the past and I've worked with a couple of clients where they've had this dance of while we feel like we're paying, we feel like we're doing everything we can to help employees. And the first thing that I always ask, usually it's the head of hr, is have you sat down and had a conversation with your top performers like before they leave, before they're sitting across from you and an exit interview. Have you sat down with your star employees and said, hey, let's get some coffee. I want to talk with you about your career. I want to talk with you about what's important and what you're trying to achieve while you're here at Xyz Corporation. [14:37] Tell you right now, I got the answer for you. If they did, they don't. Zero. I'm just shaking my head. So then I pause it. [15:13] so what I hear you saying and and number one, you go in and you're going to have that, that baseline conversation with that eight hr individual and saying, Hey, first off, who are your top performance and how do you determine who those top performers and why? Right? And then you say, Hey, what happens if they leave? Then what are you going to do? And who fills in to replace that? That knowledge bank that just went through the door and then then you can say, why don't you consider having this conversation? Say, what do you need? Where are you at? What do we can do? We want to keep you around that type of conversation. Does that. How did I understand that? Right? [15:53] Yep. You nailed it right on the head and I think a lot of people, they, they know who their best employees are. They know why they're their best employees and the gap is they think they know what their employees want, but they just never took the time to ask. And everything you do for your employees needs to stem from not just asking them, but working to understand what's important to them and what they want and get beyond, I want more money, but get to why, what were their financial goals, what do they want to achieve? Because as an employer, there's a relationship you have with the employee where if you can help them achieve their goal, they will help you achieve your company's goals. And if you can't make that work, that's why you see a lot of movement nowadays in the work spaces. You see a lot of people that transition 18, 20 months after they start a new role because they've fallen out of favor and the company and the employee can't see eye to eye. [16:48] And while sometimes the company might decide to leave the employee Aka firing termination. What often happens is the employee leaves the company. The employee goes, well, I don't see the opportunity here, but I think I see the opportunity over there and you and I could have a long conversation about whether or not the grass is greener on the other side. But the reality is, in that moment, the grass looks pretty brown under my feet and it looks green over there. I might as well try it because if it doesn't work again, we're in one of the most competitive job markets of the last two decades. If it doesn't work, you know, I can always try another one. I can try another one. And you'll get people that won't stick because they don't feel like they're growing. [17:27] Well, I, I live in real Ville. And by the way, uh, the, the analogy of is the grass greener on the other side, uh, typically as just another type of group Brownness red being old and ugly like I am. I realize that quite vividly. But nonetheless, Real Ville, um, you gotta culture, you've got a business culture and, and I would have to say the majority of the time, and I can't, I can't quote any percentage, but the majority of the time are saying, I don't care. Go leave. I don't care. And, and, and you, you can't help but impact the business in a negative way. And I don't know how, how, how do you get companies to believe that, hey, this is where we needed to go. [18:13] I, I think that a lot of times we do a disservice when we do these exit interviews and we talk with people about why are you leaving and we don't have a deep meaningful conversation around, hey, can you help me understand where we went wrong so we don't make the same mistake again? [19:59] arrived the industrial talk podcast as a new sponsored by the name of a s, g energy. Now this company helps private companies as well as public organizations of all sizes, reduce energy costs through the use of commercial led lighting, technology and electrical services. Now you know me, I'm. I'm a big fan of led just because. Well, first off I don't have to change the lights, but added on a commercial basis. Oh my gosh. The energy savings is phenomenal. The reduction in maintenance cost, phenomenal. Return on investment quick. It's, it's, it's incredible. And the environmental benefits, self-explanatory. So you have any questions about led commercial lighting? You need to check out my friends@eightsGeEnergyLlc.com. Find out more because they know what they're doing, so check them out. [21:43] and uh, we got to get nuts and bolts here and I'm looking at the, the, the, the, you know, the thing that you provided me and I want to make sure that we reached state that pain. [21:55] Yeah. So that's important. Yeah. The easiest way to sum this up is that, uh, we're in one of the most competitive job markets in the last two decades. And when we talk about pain, we talk about the fact that the market is so competitive. That salary alone isn't enough to keep us from losing our top talent. We need to start thinking about what it is they want to achieve at companies and that means figuring out how to grow and develop them. [22:24] Yeah. And as a company owner, um, yeah, I, I can, I can definitely feel the pain when that individual gets a better opportunity or fulfills whatever that individual's purpose, whatever it might be, they leave. And you know what? Because I'm human, I do a lousy job at even exit interviewing them. I do a poor job. I don't get that, that information that is necessary for me to be a better company, whatever it might be. So let's talk tactics. I'm a CEO, I'm getting some churn and I'm getting frustrated and I don't know why. Talk to me. How would you. Let's, let's go. Let's put it in action. [23:08] Yeah. So let's, let's talk about something that came up in the first segment, this idea around actually interviewing and talking with people, doing that good exit interview. Uh, if you're a business owner, don't just leave it up to your hr department. Actually get involved. Asked to be a part of the conversation if this person was really critical to your operation as a CEO, as a business owner, you should personally care about where you went wrong and if you don't have that empathy, if you don't have that, want to make things better, let me tell you, the next 10 minutes of this podcast aren't going to really help you, but if you care, take the time. Sit Down with them, ask them how the company failed them and I say how the company failed them because that's why the employees leaving. There could be a dozen reasons, but if you use that language, if you get into how have we failed you and what should we be doing better? You're going to get some really honest answers from your employees about the expectations and the things they wanted to achieve and how the company couldn't meet them there and that's going to give you a much better insight into what your next steps going to be. [24:49] happening, and if you, if you want to get ahead of it, the correct thing to do is to have that conversation when somebody's not already got both feet out the door. It's to have that conversation with your star employees and say, instead of how have we failed you, ask them, how are we failing you? What is it we need to be doing as a company to help you achieve what's important to you? But you better be humble. You're humble. You better foundation to this with an open mind. You're going to hear stuff and I promise you your correct answer is to say nothing right it down and thank them. Don't be defensive, don't say, but I mean literally they're going to tell you something and if you want a mental exercise, just keep repeating in your head the phrase, I won't be the next person to speak. I won't be the next person to speak. Let them actually get beyond the statement because they're going to actually unpack that. They're going to have first at emotionally charged answer when you say, how are we failing? And they're going to say something very direct like, I don't feel I don't like my job. [25:57] Let that silence hang and I promise you they'll follow up with the why and they'll say, I don't feel like I'm getting challenged. Now. There's something you can work with, right? And then you can. If you're going to say something, say, tell me more about that, and it's really simple behavioral interviewing, but what you're doing is you're trying to draw out their actual intentions, what it is they want to achieve. Because then as a business owner, you can figure out what it is you need to do as a company. You're not going to have solutions in this meeting. Your goal to sit down with top talent and say, what is it we need to be doing better? We'll listen, thank them, and then go back to your leadership team. You're gonna have all this data and say, what are we to do about it? [26:44] Let's make sure that we have the right perspective here. Let's. Okay, so the train has left the station. This, this individual's out the door. You got to collect that data. You got to call in in a, in a earnest, in humble way. Collect that data so that you can start building, building those tactical steps to make sure that that doesn't happen again. And, and recognize it's in a very, uh, it's an a market that is very competitive. So let's, let's, let's just, so okay, did it collected the information not being challenged? Now what? [27:20] So what happens a lot of the time is people want to grow and develop on the job. And our first instinct when we come to solutions is to just reach for a training program, reach for LinkedIn learning or Lynda reach for a over in software development. There's a thing called Pluralsight reach for these sort of online platforms where, hey here, you can get the training you need, you can learn the skills you want, but if you never had that conversation, you wouldn't actually know what kinds of growth people were actually looking for. And even if you do, you'll realize very quickly that a lot of stuff that's off the shelf feels like it might meet people's needs. But in reality people will do the training or do the coursework, do the two day seminar and I, if you go ask them like three months after the training, I guarantee you most of them aren't going to even remember what the training covered. They might remember one or two activities, but the lessons, the core learnings, all of that went out the window. [28:22] So, but, but how, how do you deal with that? I mean I lived through that. I sent a bunch of people for sales training, spent a lot of money, sent them someplace and they come back and they get boom right back into culture. You know, how much I got out of it. Do say if you're out there on YouTube, you see my fingers and it's a big goose egg. [28:45] Yep. That's exactly it. Like, and honestly, there's two reasons for that. Um, we can go into both of these. One, there's not a lot of accountability in place for the learning that occurred. And the second is the training was really generic. It wasn't in any way optimized for the learner on the first one. Accountability, it sounds really dumb, but you go send someone to like a sales training before they go to that training. If you're their manager, you and the employee needs to sit down and put together a plan of how they're going to apply what they're learning when they're back. I kid you not. The accountability makes a difference. Like if it is the reason 70 percent of training succeeds or fails, if there is no real world application of the training, when somebody has completed it, retention goes out the window after about 20, 30 days. [29:39] I think it's faster than that. I, it's real paper and I'll tell you right now. And, and um, unfortunately and uh, tapping into humility, uh, I, I did not do that. I just assumed that the trainee would take care of itself and the company would just excel in it. And like I said, it took probably two days. It's like, what? [30:08] It's hard, like the managers, if nothing else, if you want a really quick tip is if you're going to send someone to training before that person goes to training, the manager and the employee have to put together that plan it, it makes a night and day difference because now the manager is also on the hook for checking in with the employee to say, Hey, are you getting the chances to put what you learned into practice? And if not, they can make course corrections. What frequently happens is people will, if they have one on ones at all, we'll just go, oh, how are things? Things are good. They'll never follow up on the training, and then the manager has left wondering, well, Gee, why? Why did, why did nothing changed? Well, nothing changed because you never asked them to make that change with you. [30:54] And I hear you, like I said, that makes complete and utter sense. Ride that accountability, that planned before you leave and then have that manager or director or whatever, or be able to loop back and say, yeah, okay, um, you know, let's talk about it on and are you implementing the things that you learned at this training? Here's the problem. Culture. If you're not sending everybody there and then you're not creating a guarantee of that individual, boom, right back into the whatever cultural challenges they are. [32:19] it's first. It's not grounded in reality anymore. We're talking about abstract concepts. We're talking about like leadership, color, energies and things like that. And when it's not real, honestly, people kind of check out. They're going to check their phones, they're going to check work email. They don't sit there and go, oh hey, this is coming from my company talking about my company's problems, which spills right into the relevant, relevant training. People sit up in their seats, they're paying attention. They're going, oh my God, yes, that is the problem I'm having right now. I want to talk about this. I want to engage with the training, I want to actually be a part of it and honestly, and the last piece for repeatable, so it's real and it's relevant and it's repeatable because what you find is that anyone that was in the training should be able to take that training and pass it on to the next generation. Your training shouldn't be locked up in some like one person, trainer or Oracle. God forbid they leave. [33:22] Suddenly. Nobody can train anybody. I've seen that happen before. It's literally terrifying. Uh, they leave and they take all their materials with them and everyone's like, ah, now what? And it's like you start over. So more often than not unfortunately. So does that real, relevant and repeatable. The three r's sort of put, sort of tackles that generic component because sure, I can send people to a sales training and it's sales training can be very generic and it's not real. It's not relevant to, let's say, in my case, the industrial world. And it's definitely not repeatable because it's too generic. Is that what we're talking about here? [34:04] Yeah. And so if you want to use generic training, and by the way I think when you're a budget constrained or you're really concerned about, we need something like a fast fix, you definitely should reach for that. It's a perfectly fine tool. Yeah. But once again, you're going to have to have that accountability and and it's. And it's incumbent on you as the business owner to sit there and say, okay, well when they come back, how am I going to blend what they're learning with the company culture and what. What frequently I tell people is you can do a two day workshop. When they come back, you need a half day of them in the company actually focused on the real and relevancy piece at the, at a bare minimum you need. They need to come back and we need to say, okay, well how does what we learn apply to our company, just us just the people that were in the training and at our company. [37:36] an ad. You know that when somebody says, I got this great idea, we're going to be doing this, that and the other thing is so now we got to go find that domain name and then they start to mush names together and edited any, get a spelling issue and then of course you get a. You know, I can't read the name. I don't know what it means. Like yeah, I got it. I have industrial talk dot Com. Everybody knows that. That's you going and it's a lot better than the current trend of putting a color and an animal together, so you're not like purple hippo or something like that. [38:08] That was going to say, I know that note to self, let's start using animals. Okay. Anyway, so let's wrap this up because we only got a few minutes left. I want a four. We've covered some really important stuff and I gotta tell Ya, training in the, the industrial company, the business, the, the, the, the market is vital is not just vital because we want to a purpose and we want to be a master at our stuff, but it gets down to safety too, right? You better know your stuff and you know, and, and companies have got to recognize the necessity to be able to have those platforms in place. And, and, and today it's not as difficult. He got people like you and, and because he got people like you, how do they get ahold of you? Now, Jacob with a k? Probably the easiest way is gossip telling you gonna people are gonna. Say Jacob J A, c, O b. and it's like I can't find them, can't find them. [39:11] I'm sure it's been misspelled enough on the Internet that it might actually come up and Google. Yeah. So probably the easiest way is actually put together a page for industrial talk listeners. If you go to LeadSV.com, forward slash industrial, again lead US v Dot com forward slash industrial. I've got a landing page with some of the stuff we talked about today. Not only like some of the stuff I had planned because I kind of knew we were going to have a conversation about some of this stuff, but I'll actually go back and I'll. Before this goes live, I'll put it in a couple other notes around some of the other stuff we're doing and we talked about like real relevant, repeatable stuff like that. Oh. So people can see some articles, csumb insights on stuff. There's a couple of actions that you can take on that page. [39:56] Not only is it not like typical marketing page, it's actually on the lead sv site. Browse around getting informed about learning and development, learn about how to improve learning development at the team. And honestly, for a industrial talk, listeners, there's a couple of buttons on that page. You can just book some time with me, like let's actually chat. Let's talk about your training program that you're planning to send everybody to and let's just talk about what are some things we could do that will make things real relevant and repeatable or get accountability in place. Zero cost for listeners is just something I want the world to train into improve. I want to show you that we can do it in a better way. And so if you go to lead SV.com, forward slash industrial grab time, let's chat. Let's actually start retaining talent because it's a competitive job market and there's no excuse for us to be losing top talent when all they want to do is grow. [40:50] Excellent. Excellent. You, you're also, you're out there on Facebook, but I noticed that your Facebook moniker is engineering leadership. [41:00] Yeah. That actually was born out of. We started doing software development training and leadership, so it was kind of a good play on words about both engineering leadership by building it and we were engineering leaders so it just, it Kinda made sense when we started. [41:13] Then you got your out there on LinkedIn and you've got a couple of things that are out there on LinkedIn. You've got your, your personal page and that's Jacob Heuser, h e u s e r, and then of course you've got lead sv out there too on LinkedIn, right? Yep. Yup. [41:34] slash industrial page as well in case people want to follow up on any of those. Fantastic. Hey, this was great. This is needed. Anybody out there that's looking into training and really doing the three R's, making it real and relevant and repeatable. You've got to contact, uh, Jacob as Jacob with Kay and uh, really appreciate your time. My friend. I know this was, uh, I, I just really do. I, I think training is everything and it's important. So thank you very much for joining the industrial talk family. Okay. Yeah. Thank you Scott. With two t's and enjoy today's jack. It's always been two t's, Scott, with two t's. Thank you. Hey guys, hang tight. We're going to wrap this show up. Thank you very much. Once again for joining the industrial talk podcast. I will be right. You're listening to the industrial talk podcast network. [42:30] Alright, that's Jacob Heuser and that's Jacob with a k of course, and it's h e u s e r on Scott MacKenzie of course with two t's, Scott. Anyway, I appreciate their that Jacob came onto the industrial talk podcast because I know we're in the industrial space here and we are dealing with a lot of the stuff that he was mentioning and maybe solutions out there to keep that continuity going on with your business. Remember, you can find us out at a. definitely got a YouTube channel, video, videotape and it right now videotaping. How's that for showing my age and a twitter, Facebook, LinkedIn, all out there. You can find me, Scott MacKenzie. It does real talk. All of that fun stuff and really I am so glad to be back from Barcelona. Great people, great town, incredible food. If you ever decide about going out of going into your man, Barcelona has got to be a place. I mean the places are just fantastic, so thank you. Thank you for joining the industrial type podcast and I got a lot of work to do, so let's keep going and thank you and I'll talk to you later.